Delux M618X Wired Mouse featured with high performance of Fitting Your Wrist Perfectly, Scroll Wheel on the Top. M618X gives you a different tech experience. 20 degree movement for your wrist, with scroll wheel on the top, just offer the best comfort. Business meeting, switch between different devices with one button. Exclusive function for MAC OS. Designed for Reducing Pressure of the Wrist. 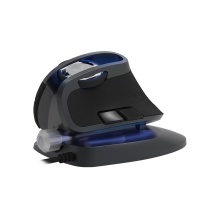 Cool Dynamic RGB Light; Adjustable 20 Degrees; Metallic Scroll Wheel on the Top; Anti-skid.